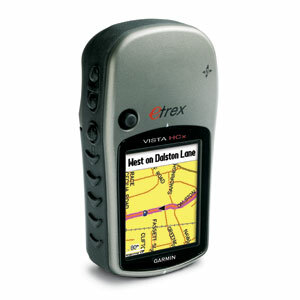 Neither deep foliage, nor canyons faze the rugged eTrex Vista HCx. Its high-sensitivity receiver holds a GPS signal in the toughest environments. This handheld navigator also has a bright color screen, barometric altimeter, electronic compass, microSD™ card slot and automatic routing for wherever adventure takes you. Mostly we use this to record our track for the day so that we can then share it with other cyclists. Amanda is a statistics lover so she is able to see where we went, how far, how high and slowly we got there. We have also used this in France to search for nearby restaurants, campgrounds and restaurants and it worked very effectively for that. It was able to tell us the route and how far we were. This model is no longer available and we know many people would like to buy it as the newer versions don’t have the same options. I can’t tell you what they’re after I just know this model is a good one. It’s accuracy is dependent on you having the most up to date maps on it which can be expensive. It is not USB chargeable and uses AA batteries which last us about 2 days of riding. having said that we have all of our maps imported and we have rechargeable AA batteries. It’s user friendly and water proof. We have also had no problems regardless of the temperature. If you like to have an emergency back up to get you directions, I recommend having one. At the same time if you have a cellular phone plan and a smart phone they can likely accomplish the same thing. I enjoy keeping track of stats and it is very effective for that and accurate. I would recommend this.